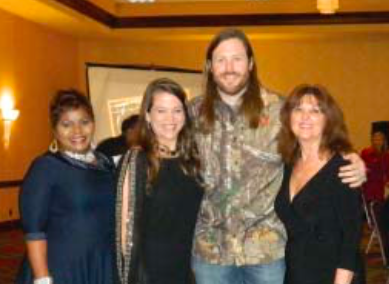 Speaker GRANT TAYLOR of TV’s Buck Commander, with new Chamber chairman Lucia Bates, outgoing chairman Kim Gonzalez, and Chamber president Margie Buentello. HOUSTON – The North Channel Chamber held their 39th annual Awards Banquet and Member Gala, last Saturday night at the Marriott Gulf Freeway. Featured speaker was Grant Taylor, of TV’s Buck Commander, and the TV program Duck Dynasty. The evening was focused on the members of the Chamber, who received recognition and awards for their contributions to the Chamber. About 250 persons attended the event, whose major sponsor was Platinum Copier Solutions. Taylor spoke to the audience about his experiences after joining the Buck Commander group in 2011, and the phenomenal interest the public has in their group. He said at the peak of their popularity, they have had 11 million viewer of their program. Taylor told of how a small, obscure company known as Duck Commander went from producing 10 duck calls a day, to handling 5000 orders a day, and how it became a household name with the TV show “Duck Dynasty.” The program is essentially a hunting show, shown on the Outdoor Channel. In 2013 they sold 1.3 million duck calls, more than all the hunters in the country combined. In explaining why the show is so successful, he notes that it is funny, relatable, and appeals to an outdoorsman’s spirituality. A new and returning board of directors was sworn in by Constable Ken Jones. Retiring board members Allatia Harris, and Greg Ollis, were recognized for their service. Ken Jones received a Great Seal award for his service to the community. Presidential hopeful Hillary Clinton returned to Houston for an evening private event just three months after her last campaign stop in the Bayou City. The private evening reception billed as a “family celebration” was at the Children’s Museum of Houston. 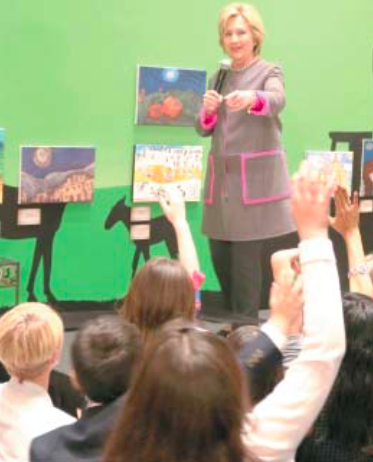 Clinton took questions mostly from the large group of children within the packed crowd. She stressed some of her goals of wanting to increase the minimum wage, making it easier for voting and improving the nation’s education system so all children regardless of race, religion or economic status will get a proper education so they can reach their goals. Despite widespread criticism of government on a national and state level, County Judge Ed Emmett said in his 2016 State of the County Address this week that Harris County government consistently provides exceptional services to residents while maintaining an extremely strong financial position. Emmett cited the county’s AAA bond rating and recent improvements in emergency management, flood control, criminal justice and veterinary health as examples of county government’s effectiveness. “Harris County is one of the best run local governments in the country,” Emmett said. But despite its successes, county leadership faces serious challenges in the coming years, especially in dealing with transportation, health care and the future of the Astrodome, Emmett said. PASADENA, Texas – The San Jacinto College Maritime Technology and Training Center on the Maritime Campus is now open for maritime training along the Port of Houston. Located at 3700 Old State Highway 146 in La Porte, Texas, the 45,000 square-foot Maritime Technology and Training Center sits 14 feet above ground and is home to more than 40 maritime courses. Williams will spend her remaining semester training in the maritime center alongside the water as she completes courses in integrated operations, bridge resource management, and radar unlimited, before her second summer internship.